Yusuf Karsh has gone to that big studio in heaven. Long live his "photographic" memory. Photographer and raconteur Yousuf Karsh, known as Karsh of Ottawa to generations of world leaders, celebrities and cognoscenti who sought immortality through the lenses of his cameras, has died. He was 93, The Toronto Star reported. Karsh died at Brigham and Women's Hospital in Boston on Saturday, said hospital spokeswoman Jacqui Fowler. His European agent, Roger Eldridge, said Karsh died of complications following surgery. Karsh's subjects have included world leaders, artists and celebrities. Karsh's studio in the Chateau Laurier Hotel where he once lived, just across the canal from Parliament, became a waypoint for many of the greatest names of the 20th century. And if they couldn't come to him, Karsh went to them. Kennedy, Castro, Einstein, Churchill, Mandela, Hemingway, Schweitzer, Kruschev. Presidents and prime ministers. Kings and queens. Scientists and doctors. Authors, composers and artists. The list seems endless. "When the famous start thinking of immortality, they call for Karsh of Ottawa," George Perry once wrote in London's Sunday Times. Karsh, born in Turkey on Dec. 23, 1908, left his native land to escape persecution for his Armenian heritage and came to Canada in 1924 to live with his uncle, a photographer, in Sherbrooke, Quebec He dreamed of becoming a doctor but didn't have the money for medical school, so after a brief apprenticeship his uncle sent him off to Boston to study photography under eminent portraitist John Garo. It was there, in Boston's museums and galleries, that Karsh discovered the cultural treasures of the world and refined his understanding of light and shadow. He launched his Ottawa studio in 1932, moving to his famous digs at the Chateau Laurier in 1972. "As a capital city, I knew Ottawa would be a crossroads for statesmen coming from London and Washington," he once recalled. "I felt there would be great advantages here and I would be ready for them when they came." On Dec. 30, 1941, Karsh had one of the most famous photographic encounters in the history of the craft. British prime minister Winston Churchill had addressed the Canadian Parliament and Karsh was there to record one of the century's great leaders. "He was in no mood for portraiture and two minutes were all that he would allow me as he passed from the House of Commons chamber to an anteroom," Karsh wrote in Faces of Our Time (U of T Press, 1971), his 10th of 15 books. "Two niggardly minutes in which I must try to put on film a man who had already written or inspired a library of books, baffled all his biographers, filled the world with his fame, and me, on this occasion, with dread." 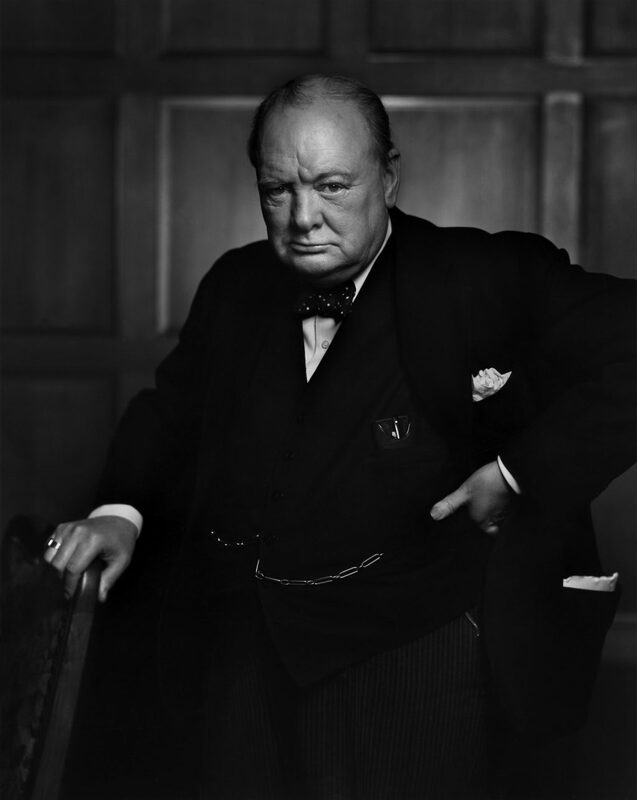 Churchill marched into the room scowling, Karsh wrote, ``regarding my camera as he might regard the German enemy." His expression suited Karsh perfectly, but the cigar stuck between his teeth seemed incompatible with such a solemn and formal occasion. "Instinctively, I removed the cigar. At this the Churchillian scowl deepened, the head was thrust forward belligerently, and the hand placed on the hip in an attitude of anger." The image captured Churchill and the England of the time perfectly defiant and unconquerable. It became one of the most reproduced photographs ever taken, used on Churchill commemorative stamps in many countries, including Canada, Britain, Australia, New Zealand and the United States. There were many other memorable encounters over the years. Karsh loved people, and could hold his own with the best of them. His sessions were events in themselves and became renowned for their repartee. An engaging, intelligent personality, he had a gift for disarming his subjects, for dismantling the walls that people erect between themselves and the camera exposing, it seemed at his best times, their very souls. "He had a great ability to get right to the heart of the matter and be able to put it into a photograph," said his late brother, Malak Karsh, a renowned architectural and landscape photographer, once said of him. Karsh was polite and curious. He asked questions, elicited answers, reflections, profound moods. His sessions became known as ``visits" and his subjects gave of themselves "with love and respect," said his brother. "People knew they had a master with them and they appreciated that opportunity. They gave him the opportunity to find out what he needed to know about them so he could render them in the best way possible." Combined with his mastery of light and composition, it made a formidable portraitist a modern-day master, working most often in shades of grey. Karsh once said the fascination of greatness lies not in accomplishments or physical features, but in the essential element that created it. "I call it the `inward power,' " he wrote in Karsh Portfolio (U of T Press, 1967). "Within every man and woman a secret is hidden, and as a photographer it is my task to reveal it if I can. "The revelation, if it comes at all, will come in a small fraction of a second with an unconscious gesture, a gleam of the eye, a brief lifting of the mask that all humans wear to conceal their innermost selves from the world. In that fleeting interval of opportunity the photographer must act or lose his prize." In September 1992, the Karsh Photographic Studio finally closed its doors to allow the master more time to pursue books and international exhibitions, which he did right up until he died. In 1997, he bid farewell to Ottawa and, along with wife Estrellita, a medical researcher, packed his bags and headed for Boston. Upon leaving, he presented a small collection of classic portraits to the Chateau Laurier, where his former home of 16 years is now known as the Karsh Suite. Canada, New York's Museum of Modern Art and Metropolitan Museum of Art, George Eastman House, La Bibliotheque Nationale in Paris, the National Portrait Gallery in London, the National Portrait Gallery of Australia and many others. 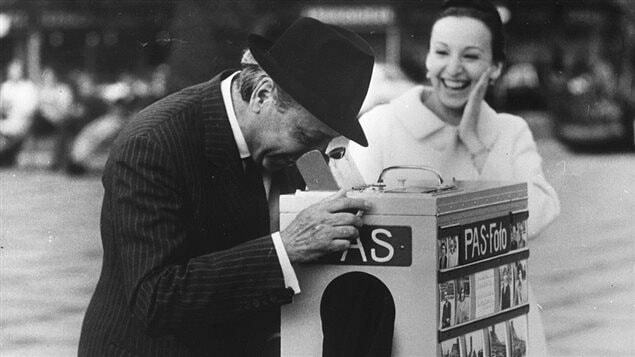 The National Archives of Canada holds his complete collection, including negatives, prints and documents. His photographic equipment was donated to Ottawa's Museum of Science and Technology. Karsh, Yousuf (b. Dec. 23, 1908, Mardin, Turkey), Canadian photographer, known for portraits of the great personages of his time. As an Armenian in Turkey, the young Karsh endured persecution and privation. At the age of 16 (in 1924) he emigrated to Canada, joining his uncle, who was a photographer in Sherbrooke, Que. From 1928 to 1931 he served as an apprentice to a prominent Boston painter and portrait photographer and briefly attended art school. Returning to Canada in 1932, he was employed by an Ottawa photographer, whose studio Karsh leased after his employer retired. He was appointed official portrait photographer of the Canadian government in 1935. He became a naturalized Canadian citizen in 1947. Karsh's portrait of Sir Winston Churchill, made in Ottawa in 1941, brilliantly conveyed the dogged determination of Britain's wartime leader and brought Karsh his first real international fame. Karsh went on to photograph an enormous number of the world's most prominent personalities, including royalty, statesmen, artists, and writers. He also continued to make portraits of world leaders. Karsh's style as a portraitist was formal. He used subtle lighting to meticulously model his subjects' faces, thereby obtaining a monumental and idealized presentation that was in accord with their public image. His books include Faces of Destiny (1946), Portraits of Greatness (1959), In Search of Greatness (1962), Karsh Portfolio (1967), Faces of Our Time (1971), Karsh Portraits (1976), Karsh Canadians (1978), and Karsh: A Fifty-Year Retrospective (1983). Is he still alive? Looks like he is! Yousuf Karsh is in the Smithsonian Dec. issue. The magazine is commemorating his 100th birthday. His portrait photographs are truly amazing. I gave as a present to my college teacher one of his books of his portrait photographs. My teacher had never heard of Karsh but was so impressed. Enjoy the slide show. See how Karsh did not discriminate between prince and pauper, monarch and miner. Yusuf, the Hanragitaran has “hovsep” in parentheses, was born in Mardin. Please allow me to rake some muck. A “fly in the ointment” if you will. Of course, we are proud as peacock with the memory and legacy of Karsh. Doe anyone know if he had ever actually professed to be an ethnic Armenian? Once again, look at Johannes’ post above, and observe that the inhabitants of Mardin were predominantly Assyrian/Souriani/Asori/Ashuri, who during the Big G also moved out with their co- religious Armenia brothers, many of which ended up in Aleppo. A long time ago, a bunch of us Armenian boys were in the school library. We had just discovered Karsh and his work, we were both admiring and having a heated discussion when the librarian, an ethnic Asori with a family name of Azrak (“blue” in Arabic, Kaputikian?) cut in and declared that Yusuf Karsh was an ethnic Assyrian. Naturally, we hot headed Armenian youth vehemently disagreed …. Just as then, even now we would be hard-pressed to demonstrate Karsh’s ethnic identity, except if he has said so. Neither “yusuf/yusef” , nor Karsh are typical Armenian name and surnames respectively. Ironically. When in those days, most Armenians in Aleppo, majority of which were from Kilikia, spoke furkish at home and on the street (except at school), the Assyrians from Mardin and Tigranakert spoke Armenian in their own “funny dialect“. Yet. 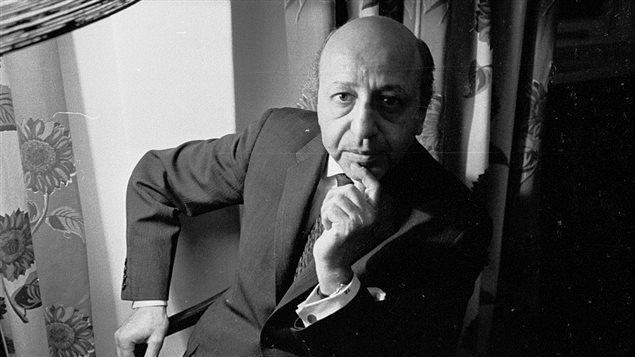 If Yusuf Karsh had professed, if he did to be an ethnic Armenian…. SO BE IT! Who or what is an Armenian? Is it what WE SAY or what THEY SAY? Yes Arpa, Yousuf Karsh did profess to be an Armenian. In the book that I got my teacher included a long autobiography by Karsh. Of course. We also know that Ivan Ayvazovski was Armenian. How many others know that? Edited by Arpa, 22 November 2008 - 10:47 AM. I have seen a lot of documentaries (Interview) about Karsh on Canadian TV and he has been always represented as Armenian. If it was not true he would have corrected them. Edited by Yervant1, 22 November 2008 - 11:30 AM. Did he, himself say so? Did he in fact speak Armenian? That is the kind of testimony I would like to see. Please show us, and tell us how he explains his “yusuf” and “karsh”. Was it meant to be “hovsep garoushian/garabedian”? Yet, I would also like to see how he explains his given name of “yusuf”, “hovsep” in Armenian, neither of which are strictly native Armenian. Coming back to “karsh”. How is it “armenian”? Karshian? karakashian, karshoghluian? Which of them is native Armenian? Edited by Arpa, 22 November 2008 - 12:19 PM. Open the link and read his own words in the biography section. But then again I think you are questioning whether he can be Armenian or not, whether he passes Arpa's Armenian test or not this what you are after, I guess you hold the ultimate and the only valid test as to who can be considered Armenian or not. Please spare me the name game we heard it several thousand times already. Arpa, I normally agree with you about staying true to Armenian words, not using foreign words when speaking Armenian, etc. but when we are talking about given names, I don't agree with you. If I agreed with you, then I'd say that half of today's Armenian population worldwide is not Armenian! This is not the proper topic to talk about this. Please allow me to move this to its proper topic. Dear Anoushik, thank you for your response, and Thank Yervant for answering my main question, and for the great site, where, for the first time I saw Karsh actually affirm his ethnic Armenian heritage. Edited by Arpa, 23 November 2008 - 11:33 PM. 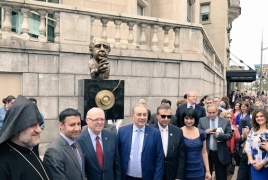 PanARMENIAN.Net - The bust of prominent Canadian-Armenian photographer Yousuf Karsh was unveiled in front of the Chateau Laurier in Ottawa, the Armenian Committee of Canada said in a Facebook post. “The bust that is a gift from the Armenian people to the Canadian people stands as a lasting symbol of the strong friendship between Canada and Armenia,” the Committee said. The event was attended by a number of guests, including Armenia’s ambassador to Canada Armen Yeganyan. 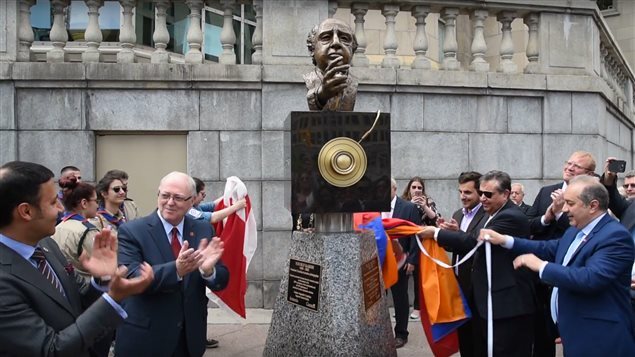 The bust is a gift from the Armenian people to the Canadian people on behalf of not only 150th of Canada's Confederation, but also the 25th anniversary of Canadian-Armenian diplomatic relations, Yeganyan said in a post of his own. The choice of Chateau Laurier as the venue for the bust was not accidental. Karsh's first solo exhibition was in 1936 in the Drawing Room of the hotel. He moved his studio into the hotel in 1973, and it remained there until he retired in 1992. Karsh has been recognized as one of the great portrait photographers of the 20th century by Time magazine and the Metropolitan Museum of Art, with the latter noting the "distinct style in his theatrical lighting." This hotel is in the heart of Ottawa near the Canadian parliament, a very deserved place for him. Arif Virani, the Parliamentary Secretary to the Minister of Canadian Heritage (left), George J. Furey, the Speaker of the Senate of Canada (second left), and Armenian Ambassador Armen Yeganian (left) unveil the statue to famous Canadian-Armenian photographer Yousuf Karsh in front of Chateau Laurier in downtown Ottawa on June 9, 2017. The memory of famous Canadian-Armenian photographer Yousuf Karsh now lives not only in prints of his photos of world celebrities and politicians but also in bronze. Diplomats, politicians and dignitaries gathered in downtown Ottawa in front of Chateau Laurier, just steps away from Parliament Hill, to unveil Karsh’s bust on June 9. The bust, featuring Karsh (1908-2002) and his famous camera that captured the likes of Winston Churchill, Ernest Hemingway and Jackie Kennedy Onassis, is a gift to Canada from the people of Armenia on the occasion of the 25th Anniversary of the establishment of diplomatic relations between Armenia and the 150th anniversary of Confederation. The bronze bust is the work of Canadian-Armenian sculptor Megerditch Tarakdjian. Ambassador of Armenia to Canada Armen Yeganian, George Furey, the Speaker of the Senate, Arif Virani, the Parliamentary Secretary to the Minister of Canadian Heritage, and Tarakdjian unveiled the sculpture wrapped in Canadian and Armenian flags. It was Yeganian’s wife, Maria, who came up with the idea of immortalizing Karsh steps away from his world-famous studio at Chateau Laurier. Karsh, whose family had miraculously survived the 1915 Armenian genocide in Ottoman Turkey, arrived in Canada on the New Year’s Eve of 1925 at age 17, sponsored by his uncle George Nakash. It was his uncle, an established photographer in Sherbrooke, Quebec, that introduced him to photography and encouraged Karsh to study with John H. Garo of Boston, a fellow Armenian and one of the best portrait photographers in New England. In 1931, with all his worldly possessions packed into two suitcases, Karsh left Boston and moved to Ottawa to establish his own career. The talented young photographer was soon noticed by the capital’s political and artistic beau monde. To make friends in this still strange city Karsh accepted an invitation to join the Ottawa Little Theatre, an enthusiastic group of amateur players. He met his future wife in the Little Theatre and received his first commission to photograph Governor General Lord Bessborough and his wife Lady Bessborough thanks to his friendship with their son Lord Duncannon, one of the lead actors in the theatre. In 1936, when President Franklin Delano Roosevelt, the first U.S. president to pay an official visit to Canada, came to Quebec City Karsh was invited to photograph him. He also met Prime Minister Mackenzie King, who became one of Karsh’s patrons. That same year, Karsh set up his studio at Chateau Laurier. It was Mackenzie who arranged for Karsh to photograph British Prime Minister Winston Churchill in December 1941, an encounter that produced one of the most famous Karsh portraits and changed the artist’s life. Churchill agreed to be photographed but his omnipresent cigar was getting in the way. Karsh had the audacity to walk up to Churchill and respectfully but firmly pull the cigar out of his mouth. That photo became an iconic image of the wartime leader and now it even graces the British five-pound banknote. After WWII, Karsh continued to photograph some of the world’s most powerful and famous people. His portraits of Albert Einstein, President John F. Kennedy, Princess and later Queen Elizabeth II, Ernest Hemingway and Salvador Dali have become an indelible part of the visual history of the 20th century. In 1965, Yousuf Karsh was awarded the Canada Council Medal and in 1968 the Medal of Service of the Order of Canada. He was invested as a Companion in the Order of Canada, the country’s greatest civilian honour, in 1990.